I'll be contacting the winners directly for their mailing information! Thanks for helping us ‪#‎CelebrateSuccess‬! 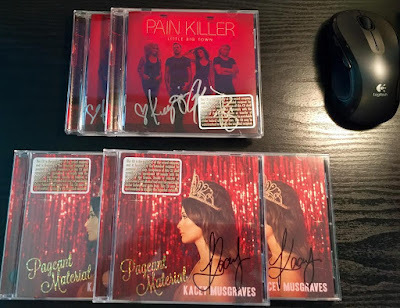 We're celebrating the success of Little Big Town and Kacey Musgraves with a chance to win a signed copy of their latest CD's, "Pain Killer" and "Pageant Material". Little Big Town made country music history last week with their controversial single "Girl Crush" being in the #1 position for the most consective weeks, eleven! After much heated debate as to the meaning behind the song, the song soared and is now a record breaking beast! Kacey Musgraves is one of few artists to make such a huge impact of country music right out of the gate. Having written several hits for other artists, she made a name for herself with her debut CD, "Same Trailer Different Park" and caused a stir with songs such as "Follow Your Arrow" and "Blowin' Smoke". Her follow up release, "Pageant Material" is a more toned down collection of songs that discuss small town life and it seems to be more personal this time around. 3 copies of Kacey Musgraves "Pageant Material"
2 copies of Little Big Town "Pain Killer"
Tweet us at @lovinlyrics letting us know which you want to win and hashtag #CelebrateSuccess. You can also go to our Facebook page and leave a comment similar to the tweet. Please leave your comment in the original post thread about the giveaway so it doesn't get overlooked! Don't do both though, you can only enter via one or the other and you can only enter once. We'll choose a winner on Monday, July 20! Good luck and thank you for supporting both of these great artists!